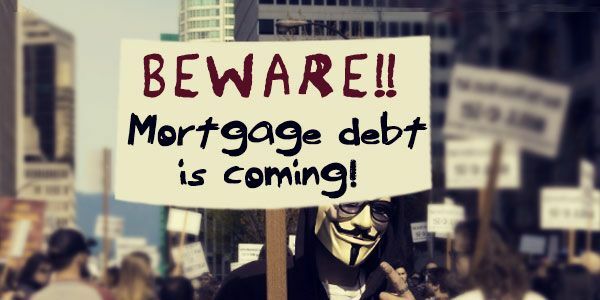 Blogs | Pedro's blog | Is it time for another mortgage debt crisis, post-2018? Is it time for another mortgage debt crisis, post-2018? Guess, people of America are forgetting the calamity of 2008 financial crisis, where big lenders and financial institutions went broke, houses got foreclosed, the value of assets depreciated, and all followed by long years of recession and unemployment! Today, it’s 2018! And, we should be concerned! The history seems to repeat itself, and believe it or not, the US economy is on the brink of a huge collapse! What actually happened in 2008, and what’s happening in 2018? Back in 2008, financial institutions started lending loans, especially security backed loans at very flexible terms and conditions. One could have taken out a mortgage loan pretty easily. These loans, given out to citizens irrespective of their credit portfolio, income status, and financial strength, were known as subprime mortgages! Most of the debtors, who pulled out such loans, could not repay them back! Also, the value of such houses went underwater! Plus add recession and other consumer debts. Now, the overall scenario toppled down, and America went helpless, financially! But have we learned our lessons? Rightnow the national debt of America stands at $21 trillion! Car loan lenders have started giving out loans to borrowers without any tight check on their credit background and examining their income and assets! Currently, these loans are called non-prime loans, and they are also available in the mortgage market, under the same name! If you are someone, who has already seen the downfall and market crash of 2007 and 2008, then you might have already started to sense, that 2018 is kind of imitating the past! About a third of all household in metro cities are cost burdened. Currently, the United States is facing a currency devaluation, where dollar value is expected to fall more in the current time, in comparison to the fixed-exchange-rate! Homeownership rate for adults of all age group are facing a decreasing slope. Median home prices in the western metro are five times higher than the average income of the owners. Homeownership rate has started to increase from 2017. This is bad as current interest rates have a higher cap than from 2010 - 2016. This means now is not the favourable time to purchase property. Household debt has started to increase, when credit card debt, student loan debt, and other personal loan debt are included. As per CNN Money, nearly 51 million households don’t earn enough to afford a monthly budget that includes housing, food, child care, healthcare, transportation and a telephone facility. Guess, it’s pretty evident that an economic storm is about to make its onset! Do other household debts affect mortgage payments? Yes! They do influence your mortgage payments! A mortgage debt is a long-term deal, where the time to repay the loan amount ranges somewhere between 15 to 30 years! On-time monthly or quarterly payment is a minimum requirement! Skipping these payments results in a difficult situation, where you are penalized by your lender, and your property might get foreclosed! As of 2018, consumer debts have risen so much that the mortgage market is getting affected upto a great extent! To meet up with the revolving credit payments, it’s pretty normal for many to skip home loan payments! But, most of us forget that mortgage is a collateral backed loan, and it involves one’s residence, so its payments should be given the first priority! Having other debts, while already carrying a hefty mortgage, narrows down your chances of clearing the home loan debt! So, it’s better not to have other debts around if you don’t own your house outright! Who carries the highest debt numbers? Middle-aged consumers, ranging from 30 to 60 year old, carry the highest number of mortgage debt and other consumer debts as well! Strangely, senior citizens and young adults claim to have the highest numbers with no mortgage debt at all! But, they top the list with credit card debt! It’s no wonder if we are hit by some kind of debt calamity. We have already walked down borrowed paths! Those that are not rightfully ours! As we don’t own more than half the things we possess! Most of our wealth is borrowed! We buy costly stuff, even if we can’t afford it in the literal sense! Then who’s to be blamed if there’s a mortgage debt crash? Remember, if you point one finger to others, then three fingers point back to you! !